The event will again take place as the Cellar to Cellar Fun Run/walk. As per last year, the 12km route will take the participants to the wine farms of the Paradyskloof and Blaauwklippen valleys. The event will start at Blaauwklippen, winding through the vineyards to Vriesenhof, followed by Dornier, then off to Kleinood, Waterford, to Stellenzicht, lastly to Stellenrust, and finishing again at Blaauwklippen. Entries can be done on www.enteronline.co.za or by registering here. Iqela.Com, ABSA, 4055354523, 334410, Cheque account. Please use your surname as reference. Running/walking through restricted areas only opening for the participants on this day, enjoying the best scenery of the Paradyskloof and Blaauwklippen Valleys. 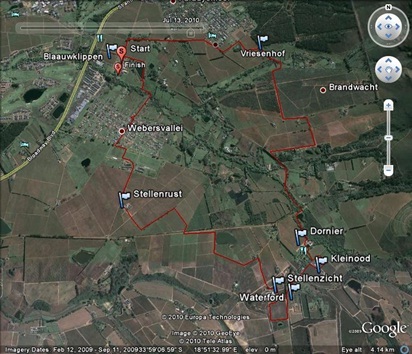 Start & Finish will be at Blaauwklippen Wine Estate just outside Stellenbosch. Registration will take place on Blaauwklippen Wine Estate next to the start / finish area from 07H00.